After some 2225 miles of ocean racing, we just about have the finish line in sight! Well, here aboard Hula Girl we certainly had our trials and tribulations on this one. The light and difficult conditions for the first days of the race made for some really tough going. Then I got us stuck in a lane too far south where we simply didn’t have the wind that our competitors to the north had. But, as strange as it may sound, as we sail for the finish line now, coming around the eastern end of Oahu into the Molokai Channel with preparations beginning for the final gybe towards Diamond Head, I don’t think I would risk changing much about this race. You see, despite all the challenges, we had a great time because we had a great crew. It was absolutely a privilege to sail with each and every one of these sailors. If the going is easy, I don’t think you really get to know people. But when you have adversity and challenges, and despite those everyone is still this great to be around, well, you know you are in quality company. Not that it was all tough going… don’t get me wrong. After we took our lumps, we had some absolutely fantastic sailing. Nice steady breezes ushering us across the Pacific. We did a great job reeling in much of our fleet, and passed another boat yesterday. And right now, off our port bow we can see the northern shoreline of Molokai, and of to starboard the island of Oahu. The translucent blue water that we have gotten to know so well still sets the stage, and the puffy white tradewinds clouds, our accompanying sailors in the sky, scoot past our finish line and continue on their way. But here our voyage ends. Diamond Head buoy, the finish mark of the 2015 Transpac, and of many Transpacs before. This 48th running of one of the top offshore races in the world is wrapping up for our crew. So I want to thank out team of Bruce, Brian, Bjug, David, Steve, and Sean, and of course coaches Chris and Patrick, for making this such an enjoyable and memorable crossing. 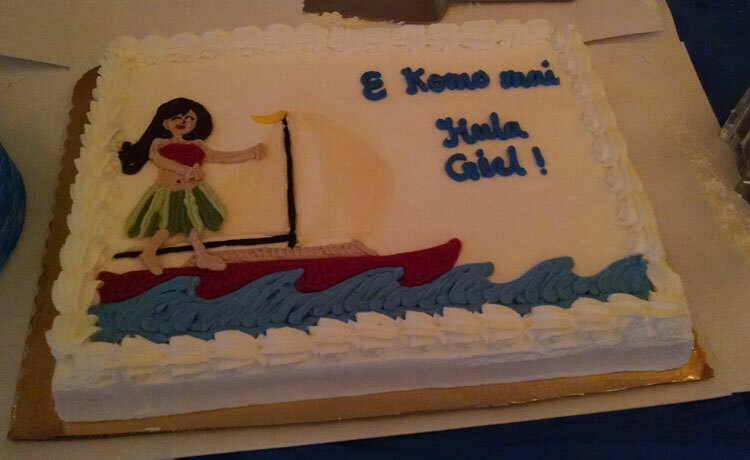 And thanks to the mighty Hula Girl for a safe, fun, and fast passage. Man, she is a delight to sail. Thanks to all our friends and family and supporters from home and around the world. Now, if you’ll excuse me, we have one last gybe to set up for, then the oh so gratifying afternoon sail down the Oahu coast, past the finish at the iconic Diamond Head, past the famous Waikiki Beach, and into the Ala Wai Harbor. Then I think there just might be a well earned Mai Tai or two awaiting our crew. Just a hunch. Hey all friends and family, just a bit overdue in getting out a report from onboard Hula Girl in the 2015 Transpac, but here we go. So after our slow start and getting pinned in the funk- wind plagued southern lane on the way to Hawaii, we finally managed to get out and into the Trades. And man, is it nice. We have had beautiful days of great sailing in winds mostly 18-22 knots. The squall activity has been mostly light, with the busiest night having been Friday night. But even then, the mid to high 20s what the breeziest we saw. A reasonable number of boats finished today, with a lot more arriving tomorrow. The Monday starters (smaller boats) and Saturday starters (biggest, fastest boats) did not get the brutal, drifting conditions that our Thursday starters had, so our gang is coming into Hawaii a bit behind the masses. They usually try to time things so that we all get there about the same time, but that didn’t happen this year. We here on Hula Girl are buried well behind our fleet leaders, but we are determined to catch our closest competitor, Adrenalin. At one point, they were 33 miles in front of us, but we have been reeling them in. At roll call this morning, they were just over 8 miles ahead. So we’ll keep pushing to see if we can take them before our finish on Tuesday. So our majority Canadian contingent on board presented some fuzzy math this morning, converting the nautical miles and times and lat/lon positions to Canadian equivalent. 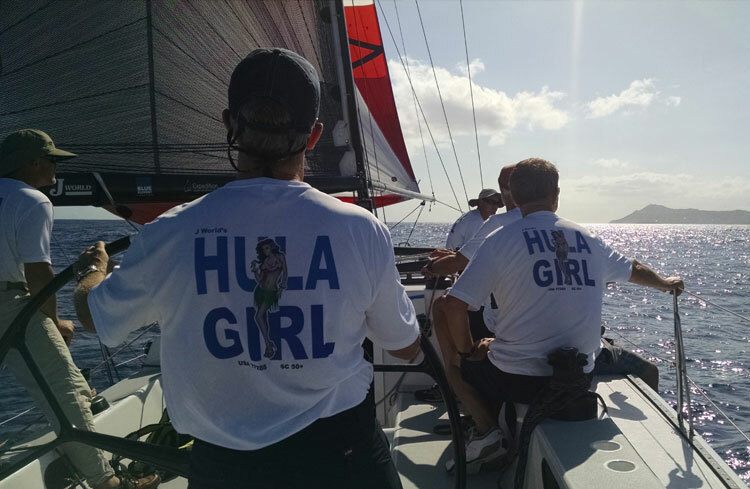 They attempted to declare Hula Girl the winner of the 2015 Transpac, but I think we’ll have to take a closer look. They definitely need to show their work on this one. Regardless, it’s been a hoot. We are all having a blast, but it has also been a long one and I know we are all looking forward to getting to the Islands! Tonight is just perfect. It’s about midnight out here, mid-Pacific. The moon is up over a shimmering sea. The clouds are sparse, and the weather warm. It’s the first night I have noticed that everyone is in shorts and short sleeves in the cockpit. In the darkness, there have been a couple birds circling Hula Girl as she rushes towards Hawaii. Maybe they are picking off the fish as she spooks them and they dart out of her path. The water itself is full of phosphorescence. It’s a bit tough to see with the bright moon shining down, but later, after the moon-set, you can see the brightness in the water, especially where Hula Girl hurls the ocean out of her path and in the smooth sizzling wake she leaves behind. Down here at the nav table it is quiet with all everyone below decks sleeping. Although ‘quiet’ is a relative term: the water tears by the hull in a rush with a rolling hissing noise. It sounds like a windy night with heavy rain. Occasionally, the boat grunts or groans when a loaded sheet is eased or trimmed, but then the water noise takes over again. So we have less than 400 miles to go. Tomorrow should be our last full day out here, arriving in Honolulu on Tuesday, so I’ll have time to get one final report off to you all. Thanks for all the positive thoughts and well-wishes that we have been getting from our friends out there! Have a great slumber tonight, and maybe dream a bit of this life at sea. It’s pretty sweet. Man, it’s nice out here. A couple gorgeous days and nights of sailing. The blue skies had some pretty spectacular cloud formations, a full 360 degrees around us. The water has the shade of aqua that you only seem to get when you are out in the deep blue. And it’s some three miles deep around here, according to the charts. The only unfortunate thing is that this tranquil scene is in the middle of our racecourse! 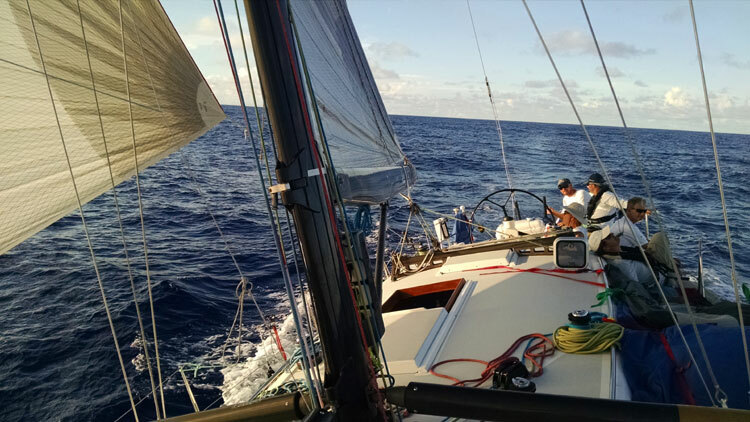 Yep, another frustratingly slow day for our team out here in the 2015 Transpac. We are stuck to the south of most of our fleet, with no real opportunity to get north. We have been in a completely different wind pattern, with breeze much farther west and lighter than the boats above us. We managed to hang in there ok on Monday, gaining on four boats while losing against three. But last night was a different story. We parked the boat for three hours in a dead calm sea. Not a breath of wind anywhere. And then barely moved for the rest of the night. So it’s not looking pretty for Team Hula Girl at the moment. The good news is that we have not even reached the halfway point (so there is a lot of time to catch up). The bad news is that we have not even reached the halfway point (the first half of the race is taking a whopping 7 days!!!). Despite the challenges and the emails to friends and family pushing back hotel dates and travel plans, everyone aboard is doing great. Honestly, I am truly impressed at the positive attitudes with which everyone is greeting the unfortunate aspects of the race which are out of our control. The laughter from the cockpit last night as we drifter was deafening out here in the middle of the ocean. Bjug said his stomach was hurting this morning from laughing so hard… so we might be slow, and we might be off the pace of our fleet a bit, but is still pretty sweet. This sailing thing is ok…. All are well onboard. David is driving at the moment, Steve trimming spinnaker, Bruce on the grinder. Chris is the watch captain on deck. We actually just hooked into a little squall and got a welcome boost of wind, with a little rain. It will do the boys good… they needed a shower! Besides, it actually feels pretty good to have a quick break from the sun. And it’s doing Hula Girl good, scooting along at 12 knots, at least for the moment. It’s a good sign that the mess we were stuck in is breaking down and we could possibly be in the tradewinds…. say it ain’t so! Rolling along, beautiful day here in the deep Pacific Hula Girl in the 2015 Transpac Race from Los Angeles to Honolulu. We are currently on day 5 of our race, and have some 1500 miles to go. Yep, we have averaged somewhere around 140 miles a day up until this point. And for a boat like Hula Girl in a race like the Transpac, that’s not really very good at all. It’s been an unusual race. We have been struggling with the remnants of the hurricane Dolores that have spun up our way from Mexico. And there are the remnants of another depression along our track, a bit farther west, that is messing up the usual Tradewinds that carry us seamlessly to the Islands. It’s an El Nino year, and the water in the Eastern Pacific is warmer than usual so these tropical disturbances that feed off warm water are working their way farther north than is typical. So even though we were able to set the spinnakers with the wind shifting behind us a couple days ago, we knew there was instability ahead. Early Sunday night, a bit after sunset, our breeze backed to the North, and then even to the West of North, so we dropped our trusty 2A spin and went back to the Code 0. Our breeze has stayed forward on us through the night, and through all of Monday, and now into midday Tuesday. We are tight reaching to Hawaii, and not even able to lay Oahu. And no way we are going back to the #1 jib… if it’s not actually against the rules in a Transpac, it’s certainly against the ethos of the race. And actually the sailing under the zero is really nice… we are able to consistently sail at double windspeed of faster. The only bummer being that windspeed is somewhere between 3 and 4 knots! We hit one big ‘glue pot,’ a patch of light and unstable wind behind a squall, yesterday and the breeze has been a little light, but other than that we have been pointed more or less at Hawaii and moving along ok. But is it enough? We got away from the California Coast a bit slower than some of our fleet and are struggling to make back some of the distance. We don’t want to just follow them, so we have opted to get a bit of leverage to the south. And now we are in a different wind angle, and stuck down here. Our breeze is averaging NW (about 285 magnetic). The benefit: better wind angle in the light stuff, maybe a bit less distance to sail. The danger: less wind down here. At roll call this morning, is seemed a wash as to which was better. Three boats gained distance on us. We gained on four boats. Either way, we have been having a brilliant sail. Yesterday evening we sailed out from under a ceiling of clouds and into a stunning sunset. It looked like the end of the sky, and sun dropped down into and through this sliver of space between cloud and water, then vanished into a fiery sea. Pretty spectacular, but no green flash, sorry Bjug!. Now we are into sunny weather with brilliant blue water… it is absolutely gorgeous. Sad to report that there is a lot of trash out here. We’ve only seen small stuff, although we caught a part of a fishing net on the keel this morning. We slowed down by rolling up the Code 0, and yours truly went for a quick swim to clear the debris. The water was great and I needed the shower…. and once I was smelling like roses the rest of the crew realized how much they stunk, and a round of morning showers commenced. Far too civilized. I don’t recognize most of the crew anymore. The light breezes mean that everything is dry, and we are keeping pretty organized. We counted slices of bread today, making sure we have enough for this long, slow race. All good, but there might be a meal of Cup O Noodles somewhere along the line! The team is doing great… and we are ready for more wind! It should be shifting around to the North, then the Northeast later today and into the night. Forecast is for 10 knots by sunset. If you convert that to Canadian knots, we should be at something like 14 knots… at least that’s the calculation David made, and I’m buying it. Ok, Bruce is making lunch so I’m going to sign off. Then I’m going to go sit on the rail and soak in some beautiful Pacific sailing. Well all right now. This is feeling more like a Transpac. On Saturday morning, the wind started to steady out a bit, and it shifted around to the south. So while it felt a bit strange to be putting up a spinnaker for the first time on a port tack, we here aboard Hula Girl welcomed the opportunity to, well, go for a sail! It had been a tough couple days. We had a 12 hour run (7am to 7pm) somewhere along the line of about 20 miles down the rhumbline. Some 58 miles in 24 hours, and a series of tacks through 130+ degrees?? Are you kidding me? All while looking at the computer and seeing 2100 miles to go! Ouch. But that is all behind us. Saturday morning we carried the 1A until midday. We had a bit of wind build and a header, and shifted to the Code 0 for a while, then back to the 1A. The breeze shifted around a bit, and we did a couple gybes to keep the boat headed towards Hawaii. Eventually, the wind worked around to the NE, and we ended up going into the night with the 2A up,. more or less VMG running towards the Islands on starboard tack. The Transpac is back! Ok, well how did we fare in all the fluky shake-up? Hmmm… not so great. A couple of boats punched out (Allure, Horizon, Paranoia), then the rest of us are left slugging it out. We gained some 15 miles on Lucky Duck yesterday, but Relentless was able to keep their delta on us. We got past Hokahey after the breeze stabilized, and that has simply whetted our appetite for more! Regardless, we still have some 1800 miles to go AND our team is really starting to learn the boat. It is always tough for us the first couple days (we run with three J/World coaches and six clients/sailors). This year we have a group of Canadians, plus one Coloradian, who sail everything from Melges 24s to a J/160. I’m very much happy with how well everyone is doing for day 2 of the offshore spinnaker work, so I have high hopes that we’ll reel some of these boats in… but it won’t be easy because, well, this is the Transpac and all of these teams are exceptionally good! What else to report? In the calm drifter the other night, a couple of whales crept over towards where we were floating. The crew could hear them blowing/breathing in the stillness. The watch captain turned on the engine which (my theory is) makes a lot of noise reverberating in the water (we can run the engine in neutral to charge batteries, just not to propel the boat). It seems to work pretty well… we didn’t see the whales again. Call me hypersensitive, but I think I have reason to be! Sunday afternoon now. Wind 15 knots. Bjug hit 11.5 knots just a bit ago. Sean on the helm right now, doing a steady 10.5 or so. Brian and Steve are crashed out. I think Patrick is pitching our Pepsi/Frito Lay guy some idea about pickles?!? Chris is designing a carbon sax so we’ll let him bring it on the boat. And me, well, I’m going to wrap this up and go outside… I think there’s a race on! http://sailing-jworld.com/jworldwp/wp-content/uploads/2015/01/Header-Logo.gif 0 0 jworld http://sailing-jworld.com/jworldwp/wp-content/uploads/2015/01/Header-Logo.gif jworld2015-07-19 22:51:002015-07-29 23:51:43Transpac is Back! 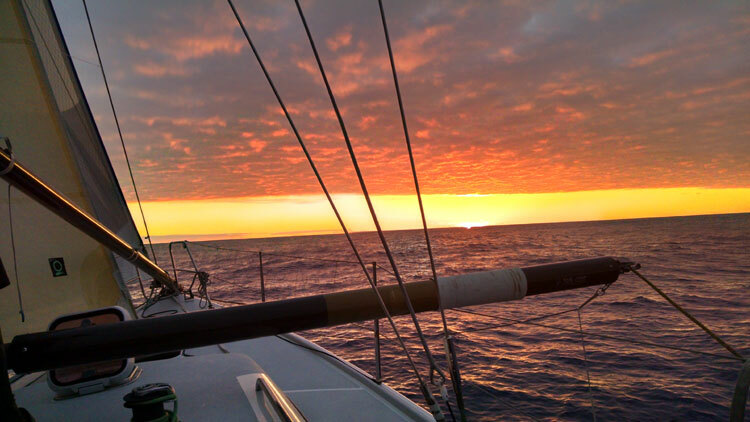 And we are off in the 2015 Transpac Race from LA to Hawaii! J/World’s Hula Girl got a nice start a couple of boatlengths down from the committee boat, with a wide lane and good speed. The beat to Catalina Island was pretty much normal, although maybe a bit lighter than usual. We had a nice 10 knots, and carried our heavy #1 jib all the way. For a while it looked like we might lay the island, but it ended up taking a couple tacks to get around the West End. Then we were off on the starboard tack drag race, pushing out to sea, through the last of the Channel islands and into the beautiful Pacific.. The breeze held wonderfully through the night, and we had a fantastic sail…. but in the morning, well, it was a different story. The Pacific is certainly living up to her name. We knew it was going to get light. Everyone out here did. So it was absolutely no surprise as the breeze tapered off and left us struggling to nurse every once of power, every drop of speed, from our sails and our boats. It’s now late Friday night (well, early Saturday morning), and it has been a tough day. The unstable, light, shifty breeze has taken a consistently high level of attention and focus. I have always argued that it is tougher to sail a boat efficiently when it is light than when it is heavy. then throw in an ocean swell that is coming from an entirely different direction than the wind, and well, you have a bit of a challenge on your hands. What little breeze there is seems to always come straight from where we want to go, straight from Hawaii. and so we try to play the huge shifts to make any progress at all towards the islands, but our tacking angles in these light breezes are huge, and the tacks are slow and painful. Regardless, the crew has been doing a great job in these challenging conditions. It’s a new boat (to them), a new team, a new event, and, well, even a new ocean for most of them! So while it isn’t your typical Transpac so far, we are pretty much rolling with it and we’ll see what shakes out. Still have over 2000 miles to go! There is the tropical storm Dolores pushing up form the south, and then the typical tradewind flow that should try to develop again, well, hopefully before this race ends, so who knows where the breeze will be, and when it will get here? We all have our guesses, I am sure, and it will be interesting to see everyone’s position tomorrow morning after this instability has shuffled up the fleet. I would expect there to be a pretty big spread in things…. Life onboard is good. We have seen whales and dolphins, little jellyfish and lots of nice blue water. Had to back down in the middle of the night when we landed on a kelp island in an apparent attempt by the on-watch crew to claim it for King and Country. I am glad I have hidden/rationed much of the snack food onboard since everyone just grazes when it gets light. It’s dark out tonight, clouds covering the sky and soaking up what little light there is…. and while it sure makes the phosphorescence in the water something wild, it also makes the sailing really, really tough. 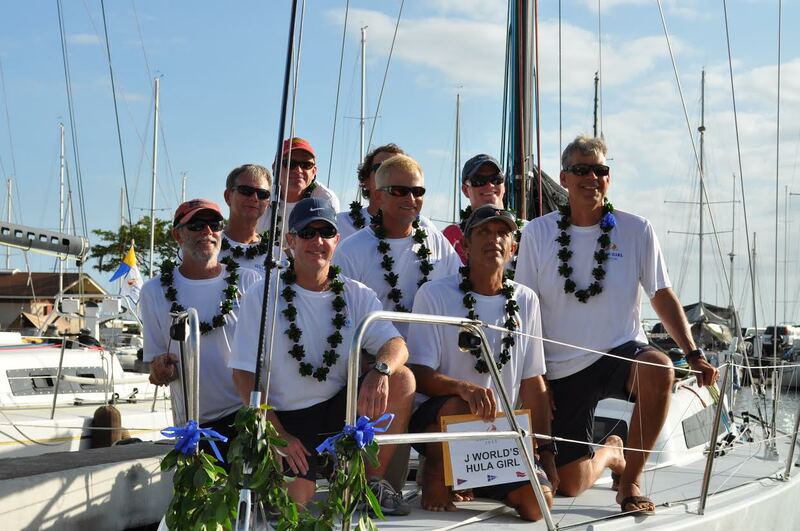 Anyway, that’s it for now… our preliminary report for this running of the Transpac, Stay tuned for more! 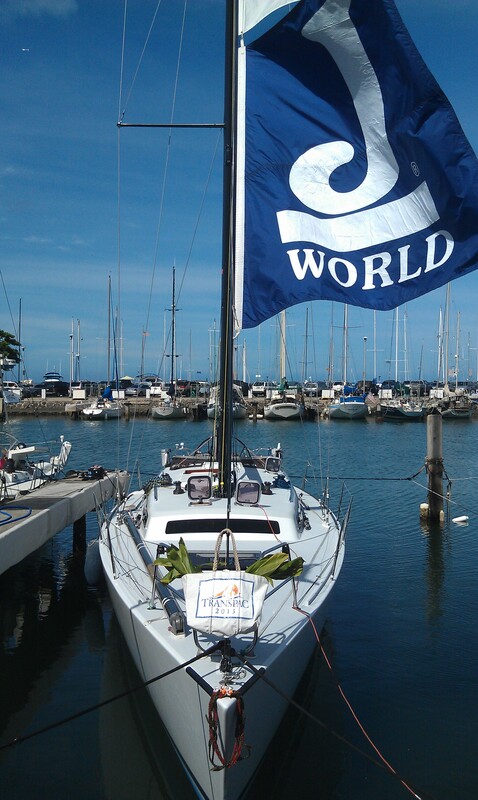 J World’s Hula Girl is prepping for our start in the 2015 Transpac race tomorrow! We’ll be posting reports and updates from the boat, so stay tuned! http://sailing-jworld.com/jworldwp/wp-content/uploads/2015/01/Header-Logo.gif 0 0 jworld http://sailing-jworld.com/jworldwp/wp-content/uploads/2015/01/Header-Logo.gif jworld2015-07-16 03:24:372015-07-16 03:34:56Transpac 2015! Super Cool…. J/70 World Champions! So just last month we were excited to announce our elite J/70 Clinics that we’ll be running in August and September in San Diego. In addition to our J/World Team, we’ll have Willem Van Waay coaching. We described him as a J/70 expert, second in the Worlds in 2014 and many, many wins under his belt. Well, if there were any doubts about his qualifications, lets get rid of those: Willem was on the team that just won the 2015 J/70 Worlds in La Rochelle. And they did it decisively in the 78 boat fleet, winning by 14 points! Seriously cool. A huge congratulations to Mexico’s Julian Fernandez Neckelmann, Willem, Bill Hardesty, and Erik Brockmann. Now: where else can you join a small workshop with the current World Champion?? Space very limited and going fast. More info here. http://sailing-jworld.com/wp-content/uploads/2015/07/01.jpg 475 950 jworld http://sailing-jworld.com/jworldwp/wp-content/uploads/2015/01/Header-Logo.gif jworld2015-07-11 19:04:562015-07-11 19:04:56Super Cool.... J/70 World Champions!